High End 2011 Show took place from 19 to May 22 in Munich, Germany celebrating its 30th Anniversary. The show including more than 300 exhibitors from Germany and other overseas countries is becoming European oldest and a leading consumer electronics fair and 50% of exhibitors are companies from overseas. The High End has become the most attractive and important trade fair in Europe not only but manufacturers from overseas. We, at Combak Corporation have again participated the Show this year. 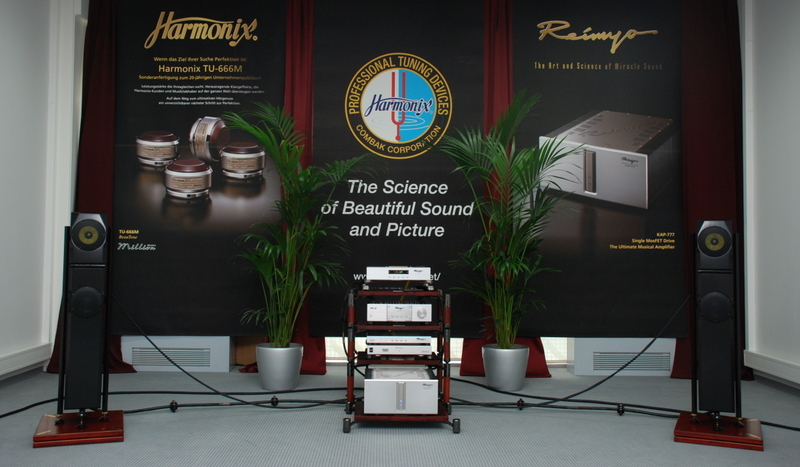 Reimyo and Harmonix have been well known and accepted among serious European Audiophiles as outstanding High end products, attracted many visitors at home and countries around Germany. Listed below are some samples of review contributed by reviewers at home and other countries. To open my show report frank and free, in the most of rooms the music were played much to loud under the guise of ‘ Dynamic‘ you would expect the term ‘Dynamic’ should not be confused with ‘loudness’. With my sincere opinion there was only one room at the show where I heard really decent music play. People who know me, know what I mean! The Harmonix-room played ‘Belafonte at Carnegie Hall’. I found myself nailed to the floor. It really captivated me, just like all other people in the room. Grandiose: it was at the Reimyo and Harmonix room where I experienced a fantastically transparent, virtually three-dimensional live recording of performance by Harry Belafonte. The system and its love for detail that Virgil Warren(WQS) put together was rewarded with a perfectly balanced, dynamically unrestrained and simply marvelous-high-end audio at its very best! Last year Virgil Warren surprised me with the Reimyo/Bravo-Consequence speaker systems, though under deplorable conditions. This year his system finally played in a sufficiently large room and sounded simply magnificent! Virgil Warren had assembled a system that generated almost the ultimate “captivation factor”. Every time I was passing by and stuck my head into the room, the sound was so riveting that I couldn’t move. A real hot tip.